One of the opening shot establishes the mythic reverence of the character known as The Motorcycle Boy, a deep focus shot of a derelict street sign with graffiti plastered over top. We never really know the Motorcycle Boy’s real name, part of the conscious archetypal characterizations consistent in the film. Even the Motorcycle Boy’s brother, Rusty James is always referred to with both names. Why not, call him ‘just Rusty’, or ‘James’? These are creative choices made by S.E. Hinton and Coppola to create a strange alternate cinematic reality, and a far cry from the nostalgic realism of The Outsiders. 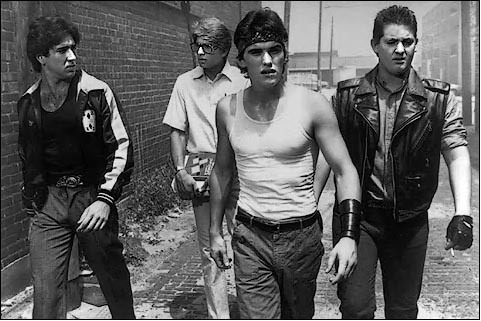 As suggested by the opening, The Motorcycle Boy is a near mythic legendary gang leader who has left the dusty midwestern small town for California, leaving his younger brother Rusty James as defacto leader of the gang. But the celebrity weighs so heavily on Rusty James, he’s morphed into an aggressive, alcohol abuse miscreant. But loyalty runs deep in these parts and his friends Smokey (Cage), BJ (Penn), and Steve gamely back him in his street rumbles. Like the street rules of West Side Story, fights get sanctioned by the gangs and become a form of an internal policing of sorts for this fringe social organization. The first act builds to Rusty James’ rumble with rival Biff Wilcox. While the stark Toland-inspired deep focus photography produces some beautiful stylized imagery early, the film reaches its bravura brilliance during this key sequence. As the combatants gather at the vacant garage lot as night Coppola douses his frames with billow smoking in every corner of the frame, blasting the characters with expressive lightning strikes, lighting which glistens and sparkles off the rain-soaked ground. Stylized gangster-speak and bold camera movements help embellish this electric sequence. The actual fight, choreographed by San Francisco Ballet directorMichael Smuin, occupies a wholly unconventional plain of cinema reality. At the end of the scene when Rusty James is sliced we see the Motorcycle Boy’s dramatic return, performed by the badboy personification of 80’s cool, Mickey Rourke. As the narrative progresses, reverting at times to a slow and stagey two-hander between Rusty James and the Motorcyle working through their brotherly issues, it’s clear Coppola serves to satisfy audiences willing to embrace the unconventional and avant garde. Rourke’s aloof performance borders on James Dean and Marlon Brando-like affectations, but there’s denying the allure and attractiveness of Rourke. His quiet whisper, barely audible and even when we do hear him speak, it’s like exagerrated Brando jibberish. It doesn’t matter what the Motorcycle Boy says, but how he says and it emables Rusty James’ angst and the burden of living under his brother’s shadow. Thus, however unconventional in style, this conflict remains highly accessible and identifiable. The glue which connects all of Coppola’s cinematic eccentricities together is Stewart Copeland’s inspired score, which eschews both the traditional orchestral approach and the then-trendy synth score popular at this time for percussion-heavy cues mixed with strange pops and clicks and weirdly rhythmic piano notes. Sadly it was one of a number of perceived Coppola failures of the 80’s which brought his career downhill towards near oblivion, but history has proved kind to Coppola. Free of expectations and the burden of matching his 70’s success, we can now revel in Coppola’s eclectic and admirably 80’s output. Studied this film in school, frame by frame. Awesome and memorable in every way. Cinematography by Stephen Burum, music by Stewart Copeland. An art film for kids (and adults.) I now want to see it again. Can't seem to find it on Blu Ray though.